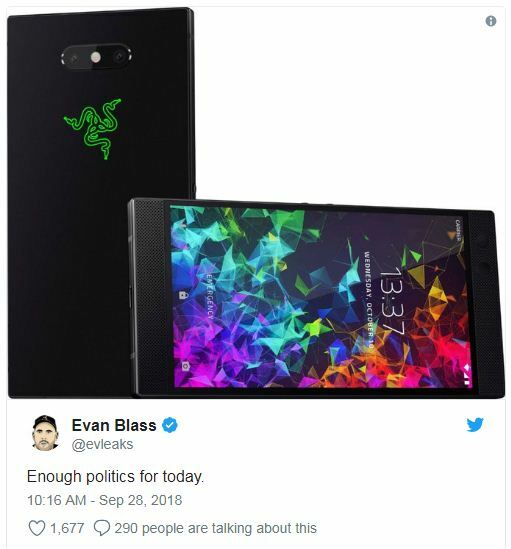 Recently, the newly formed US smartphone manufacturer Razer has sent out the invites for the announcement of its latest smartphone Razer Phone 2 on 10th October, 2018. Now the press image of the upcoming device Razer Phone 2 hit the web via the reputed tipster @evleaks and revealed much similarity in design to its predecessor Razer Phone that was announced in November last year. The leaked image also shows the dual rear camera just at the top of the device including the LED flash at the middle . We can see the three-mouthed snakes glowing in green logo just its below. 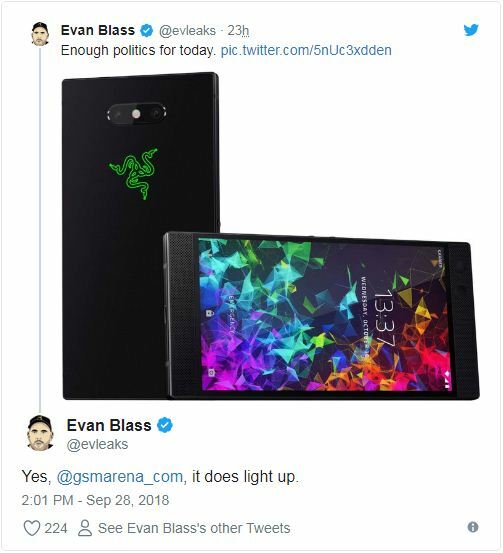 Also Evan Blass came with the confirmation that its back will be fully Led-illuminated and it will light up during playing game as well as on receiving notifaction. Since, it has already spotted on AnTuTU and according to the listing, the upcoming smartphone Razer Phone 2 will sport 5.7-inch QHD Sharp IGZO screen, 8GB RAM, internal storage capacity of 64GB, which can be further expanded up to 512GB. It will powered by Snapdragon 845chipset and will run on Android 8.1 (Oreo). We have to wait few more days to get the more confirmed information related to it .